"Look at that - the stars are out!" This looks so lovely. A new set of trailers have been uploaded online for the French animated film The Little Prince, from director Mark Osborne based on the beloved book of the same name. We've already been posting a number of trailers, but these new ones have English voices thanks to an entirely new voice cast including: Jeff Bridges, Rachel McAdams, Marion Cotillard, James Franco, Paul Rudd, Benicio del Toro, Paul Giamatti, Ricky Gervais, Albert Brooks, and Bud Cort. I love the animation style of this movie, but I also like the way the narrative intertwines the life of a young girl growing up and the original charming Le Petit Prince story we know. I'm looking forward to this. The Little Prince, originally Le Petit Prince, is directed by Mark Osborne (Kung Fu Panda) and written by Irena Brignull (The Boxtrolls). 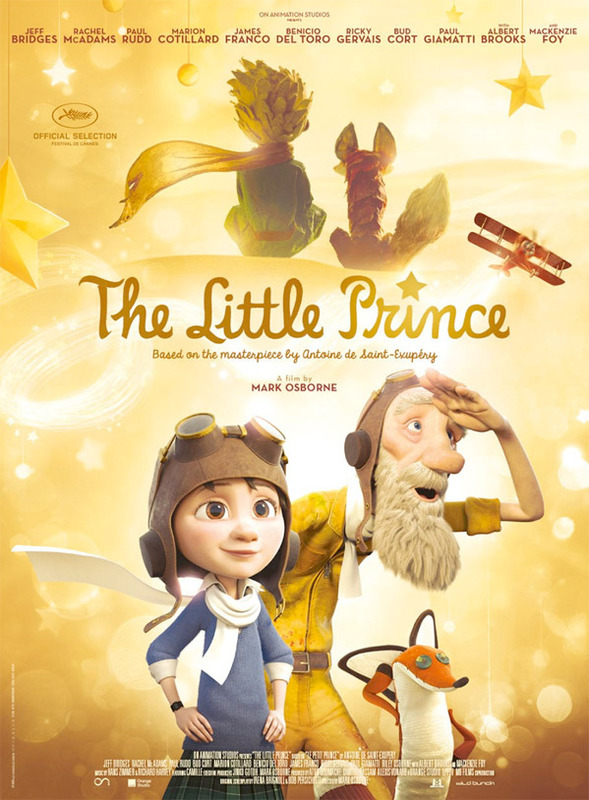 Based on the novella of the most famous work of the French aristocrat, writer, poet and pioneering aviator Antoine de Saint-Exupéry, the story unfolds as a pilot stranded in the desert awakens one morning to see, standing before him, a most extraordinary little fellow, who teaches him the secret of what is really important in life. The English version of the film features the voices of Rachel McAdams, Mackenzie Foy and Jeff Bridges. The Little Prince first hit theaters in Europe earlier this year after premeiring in Cannes, and opens in select US theaters starting March 18th, 2016 next year. You in? Oh wow, this looks delightful. The "Little Prince" world looks amazing. The "real world" looks mediocre, I mean aesthetically. The film itself (plot) seems to be something magnificent. I see what you mean. I kinda agree.